Ideal to use in the classroom when exploring numbers in the real world. Print a copy for each child in the class. A black and white version is also available. Alternatively, print and laminate a class set to be used with a removable marker. 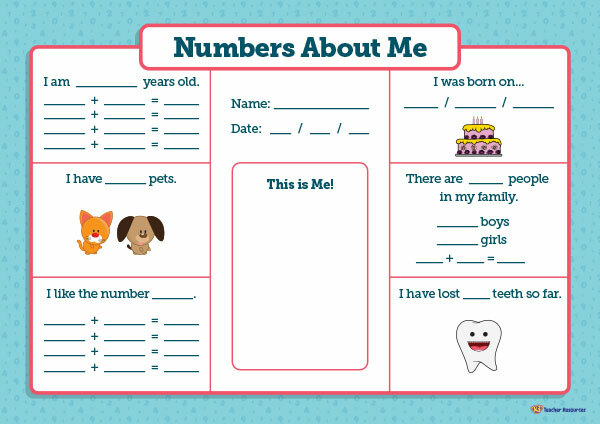 Ask the children to fill out the worksheet by recording numbers that match their age, number of pets, the date, their date of birth, number of family members and the number of teeth they have lost. Encourage the children to create number sentences that add up to the number of their age, the number they like and the number of members in their family. What comes next – As a class, share and compare the different numbers and number sentences. Good morning Sonia, thank you for your positive comment. We hope that you enjoy using these resources with your class.